College dreams are about to become reality for the first group of La Crosse high school students to graduate after participating in the AVID college-readiness program. Central AVID students Thomas Yang and Tou Bee Xiong. 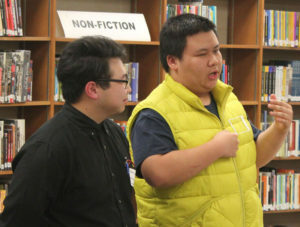 For Thomas Yang, who intends to go to the University of Minnesota Rochester, AVID classes have helped him feel prepared. “Otherwise, I never would have thought about being ready for college until about right now.” Thomas is interested in ophthalmology. 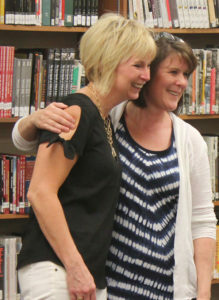 Sally Manninger gets a congratulatory hug from retired Central AVID Teacher Danette Tritch. For Kaylee Roths, AVID “helped me step outside myself and focus.” She also learned that it’s OK “to reach out for help.” Kaylee is going to start college at Western Technical College with plans to transfer to either UW-La Crosse or Viterbo University and pursue a nursing career. 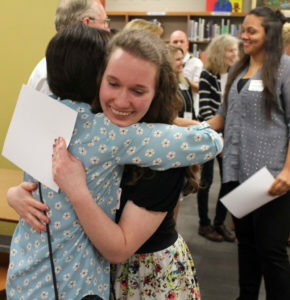 All four students were among a group of seniors who shared their experiences as part of a special AVID celebration held May 5 at Central High School. 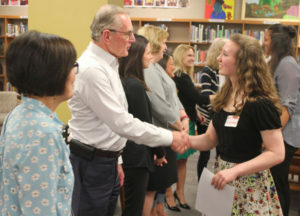 About 35 students attended, along with teachers, administrators and community members, including key donors who supported the launch of AVID three years ago. In all, 41 students involved in AVID are graduating from La Crosse Central and Logan high schools. All but one has been accepted into either a four-year or two-year college, and that remaining student (along with one other AVID graduate) plans to join the military before pursuing college, according to data compiled by the two high schools. At this time, 28 are planning to attend four-year colleges this fall, and 11 will start at two-year colleges, some with the intention of transferring later to a four-year college. The majority of these students will be the first in their families to go to college. 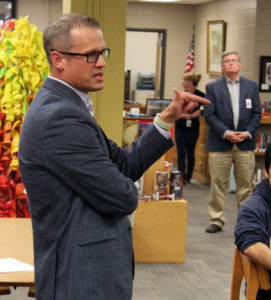 Former Central Principal Jeff Fleig, who was instrumental in the launch of AVID during the 2014-15 school year, spoke of the key support from Superintendent Randy Nelson (in the background). 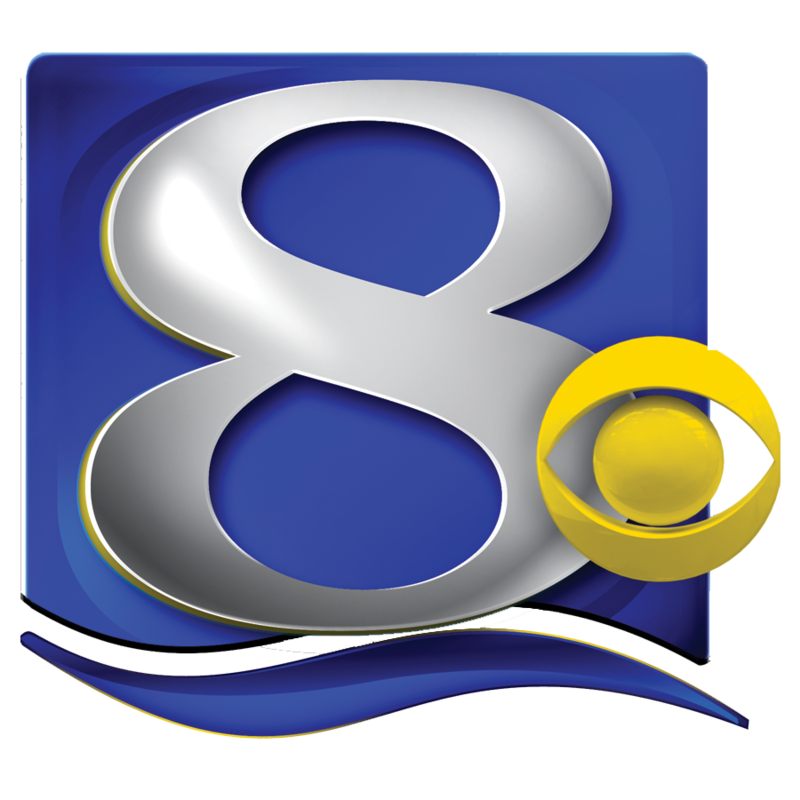 The program was phased in over three years, supported by about $230,000 in grants and other donations to LPEF. 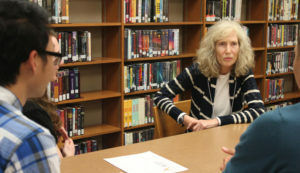 At full implementation, the program is expected to serve more than 200 students a year between the two high schools. AVID has a proven track record nationally in nearly 5,000 schools. 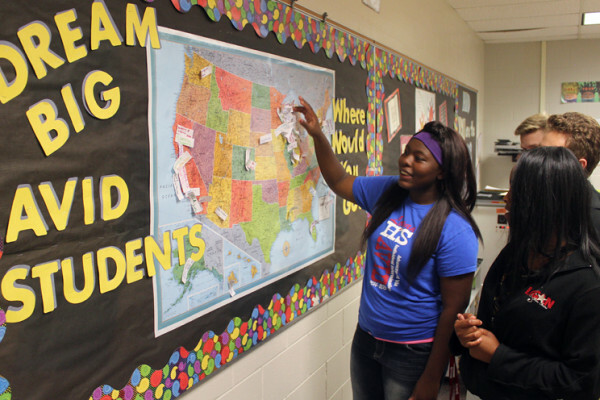 The key is to focus on the assets that students bring to their schooling, rather than on their deficits or shortcomings, said Jeff Fleig, the former Central High School principal who was instrumental in launching AVID for the 2014-15 school year. “Empathy, not sympathy,” said Fleig. Fleig, now a middle school principal in the Glendale-River Hills School District near Milwaukee, was a featured speaker at the May 5 celebration. He spoke about the important role played by Superintendent Randy Nelson in getting behind the implementation of AVID, and he thanked donors for their support. 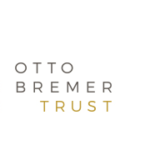 He also credited students with helping him see that some school policies “were not about student choice,” in particular screening processes requiring teacher approval before a student could be enrolled in an Advanced Placement course. 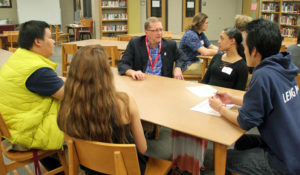 Festival Foods Chairman Dave Skogen, who has volunteered time and financial support for the AVID program, speaks with seniors and asks about their career plans. 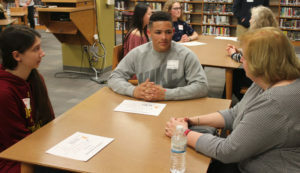 As students shared their experiences with donors in a series of small group discussions, they often talked about the importance of mentors and the relationships they have built. And they credited AVID with helping them grow and build self-confidence. “It’s not about who you are on the outside,” said Tou Bee Xiong, taking off a bright yellow vest jacket to illustrate his point. Central High Principal Troy McDonald greets students, staff and community supporters for the AVID celebration. Logan High students Jar Xiong and Kaylee Roths share impressions of AVID. Logan AVID Teacher Carrie Harings talks about the long list of expectations for AVID 12 students. AVID Teachers Andrea Kramer (Logan) and Ellen Koelbl (Central) were instrumental to the launch of the program these past three years. Community supporters and donors line up to greet AVID students after presentation of certificates. 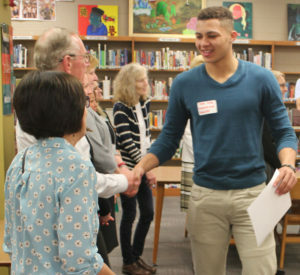 Central student Kobe King, a UW-Madison basketball recruit, is congratulated by Festival Foods Chairman Dave Skogen and retired teacher Danette Tritch. Dave Skogen congratulates Sally Manninger. Students share college plans with Dave Skogen. 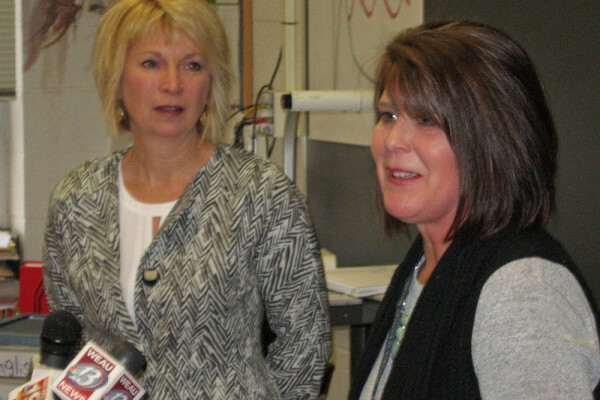 LPEF Board Member Anna Prinsen, of Fowler & Hammer, and State Bank Financial’s Jill Hamilton speak with students. Brad Quarberg, a member of the Board of Education, and also an LPEF Board member, visits with students. 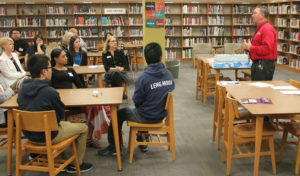 Former LPEF Board President Teri Wildt, along with Ashley Santolin, both with Mayo Clinic Health System Franciscan Healthcare, meets with AVID students. Sue Christopherson of Fowler & Hammer, and also president of the La Crosse Community Foundation Board, shares her experiences with students. Sue Christopherson listens as students talk about their AVID experiences. Petra Roter, executive director of the La Crosse Community Foundation, talks about college life with students. 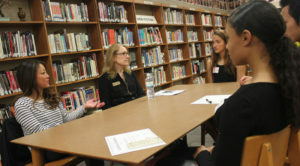 Laura Olson of Gundersen Health System visits with AVID students.